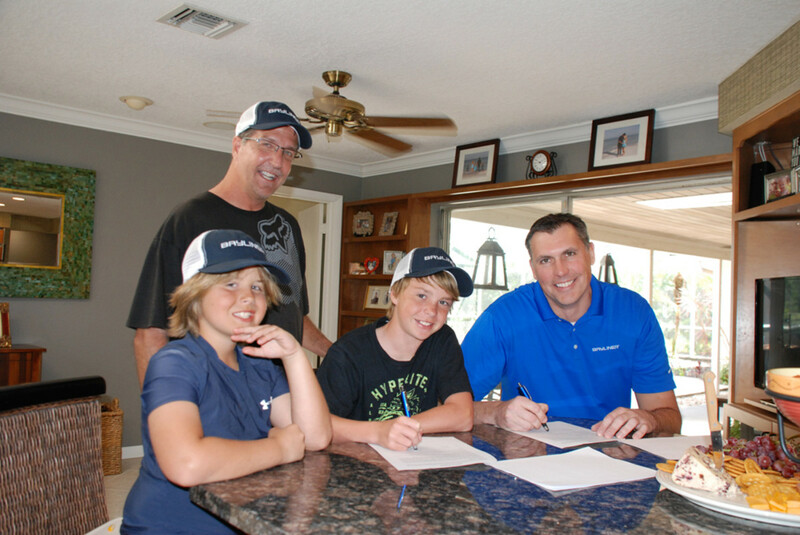 Bayliner Boats signed a sponsorship agreement with 12-year-old Garrett Coleman, a nationally ranked champion wakeboard rider. Bayliner Boats is sponsoring nationally ranked champion wakeboard rider Garrett Coleman (center). Coleman, who is 12, will train behind a Bayliner 215 Flight Series Deck Boat. Coleman will train behind a Bayliner 215 Flight Series Deck Boat that also will be the personal boat he and his family will use in Orlando, Fla. Coleman won his age bracket at the 2014 Gravel Tour, the sport’s biggest youth wakeboarding series. Bayliner said the 215 Flight Series that Coleman will use is set up for wakeboarding with special Flight Series graphics, a ballast system, a Monster wakeboard tower, board racks, an extended swim platform and Mercury Marine’s all-new 4.5L 250-hp engine with Bravo 3 drive. Wakeboard champion Greg Nelson learned to wakeboard behind a Bayliner when he was young. Nelson, now Hyperlite Wakeboards’ vice president of marketing, took an early interest in Coleman’s career, signing him to represent the wakeboard maker in 2013. Coleman competes at such events as the WWA National Championships and the WWA World Championships during the summer and represents Hyperlite Wakeboards while doing so. Hyperlite took an interest to Garrett after watching him compete and getting to know him.